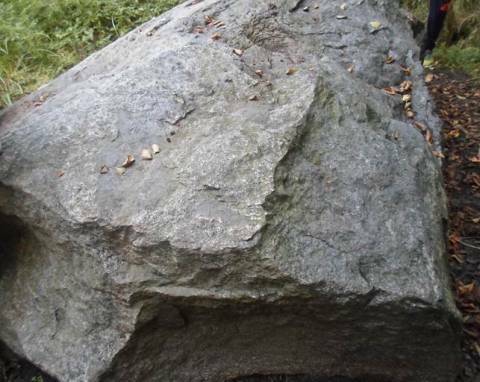 The Devil's Stone is a large rock, 4 metres high, 3.5 metres wide, and weighing approximately 50 tonnes. 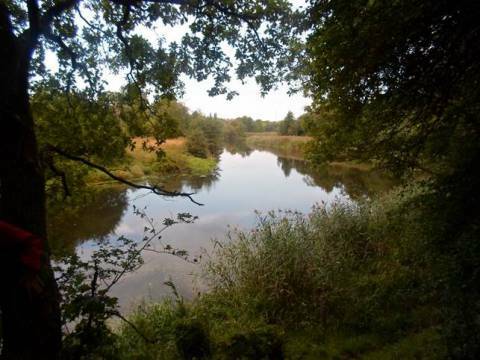 It is a natural heritage of national significance and is protected by the state. 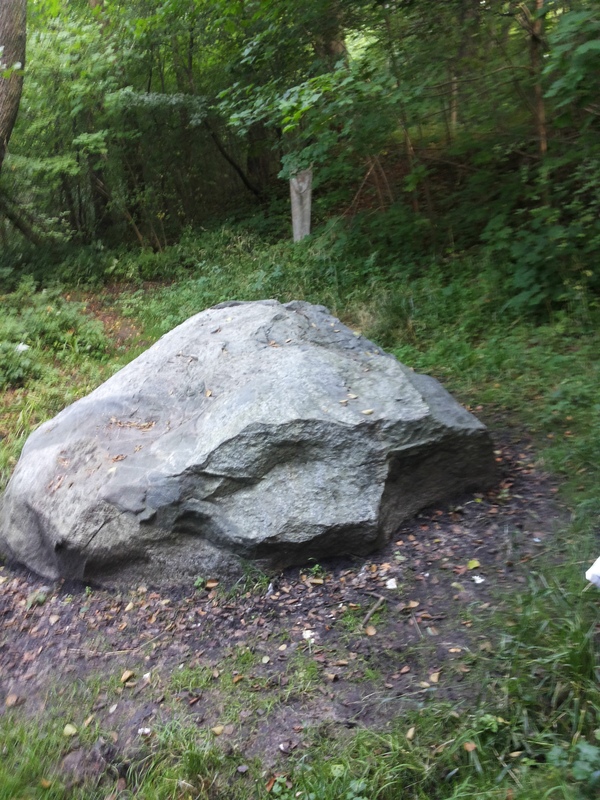 The rock is located in the northern part of Klaipėda, on the left bank of the Danė River in the district of Tauralaukis. 20th century Lithuanian explorers noted that this stone was mentioned in the 1253 Chronicles of the Crusaders, namely in the description of the walls of Memel. Historians associate the Devil's Stone with the sacrifices to the old Baltic gods (in Baltic mythology, Devil's equivalent was a god named Velinas) because there is a cavity in the stone, like a chiselled well for the sacrifice. Since the stone is located in the former Curonian territory, there is no doubt that their ancestors also smouldered amber on this stone. The manor lord and the Devil playing cards. A manor lord, who lived in Tauralaukis, liked to play cards on the stone. Once he was playing against his worker, who lost the game. The worker then stood up and told the lord: “go to the Devil!”. On the night of St. John's Day, the lord went to the stone and met the Devil, who was holding a satchel of money. The Devil played against the lord and lost all that he had in the satchel. 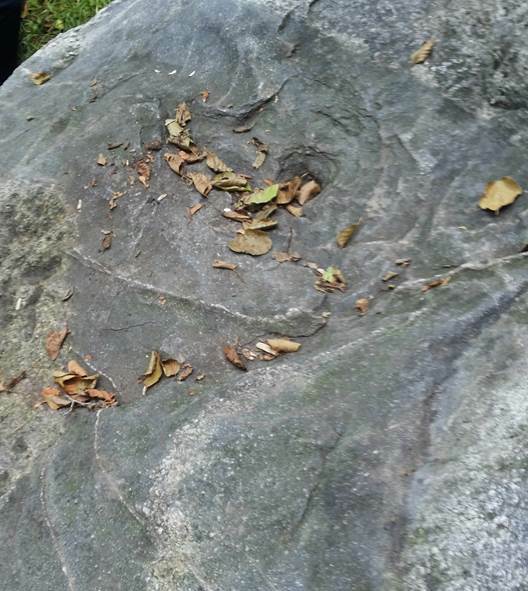 He too became furious and hit the stone in anger, leaving a hand mark on it. According to some people, the lord won all of the Devil's money, but he could not use it anywhere because the money was covered in hot tar during the day and, during the night, it was glowing hot. The lord was already haunted by ghosts of former farmers who lost their soul the Devil. So, the lord began to wander around the stone at night. His idea was to return the money to the Devil. He kept calling the deity, but he never showed up. Then the lord decided to bury the forsaken money under the rock, but as soon he was done burying, the Devil showed up and asked the lord where the money was. The lord replied: “I buried it.”. The Devil responded with: “Well then dig it up again!” The lord started to look for the money, but he could not find it. Then the Devil sat the landlord onto his neck and jumped into the depths of the Akmena River. The Devil and a crusader, playing cards. On the night of St. John's Day, the Devil and a crusader were at the stone. The game started and luck has abandoned the crusader. However, his solution was to draw crosses on each card, which the Devil could not resist and started to shake. The tide has turned and the Devil started losing at the game. He grew angry and began to jump around the stone, when a rooster suddenly started crowing. At that moment, the Devil hit the stone so hard that it left a deep hole in it and as he was running away, he grabbed the crusader by the neck and dragged him off into the depths of the Danė River. Nowadays, the stone can be found in the swampy area of the Danė Bay. The migration of the Baltic tribes. 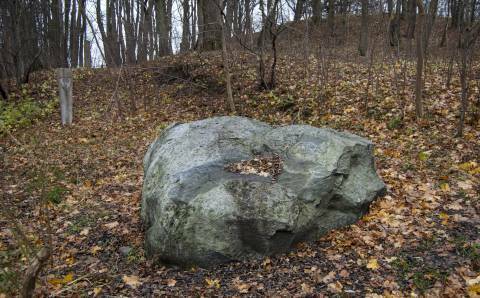 When the Baltic tribes were migrating to their new home, they stopped by the large stone as it was shaped like a table. The tribesmen decided to stop here and to eat something. They sent out two brothers to scout the area – Stag and Wolf. Stag walked down the right bank of the river and reached its mouth, which lead into the sea. When he returned to the rendezvous point, his brother was not there. 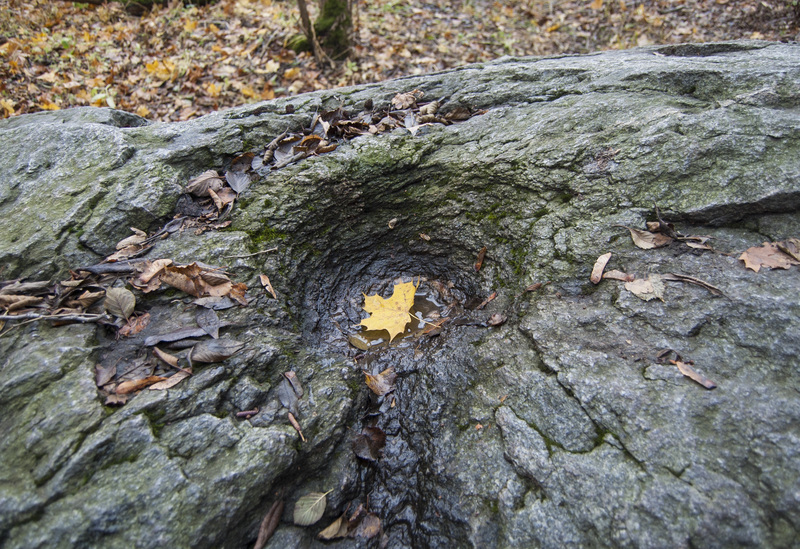 Stag found a set of footprints, which lead him to a quagmire. The last footprint seemed boggy. 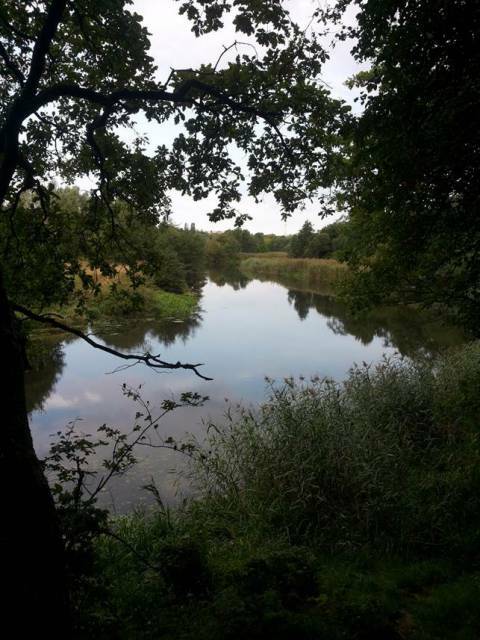 This is where he found the sunken remains of Wolf. The tribesmen decided to set up camp next to the quagmire, so that it would be more difficult for the enemy to reach their camp. The chieftain placed his hand on the stone. The other tribesmen made an outline of the hand and engraved it. This symbol marked the territory and the hunting grounds of this tribe. The newly founded settlement next to the Danė River was called Klaipėda. The stone crushers. The new ruler of Tauralaukis placed his hand on the large stone and expressed his will – to crush the stone and to bring the fragments to the location of the manor, where it will be laid down as the foundation. However, as soon as the stone crushers started their work, someone would get injured, which lead to the spread of the rumour that the large stone was possessed by the Devil. Since then, the landlord attempted to talk people into helping him with the stone, but nobody dared to accept his offer. 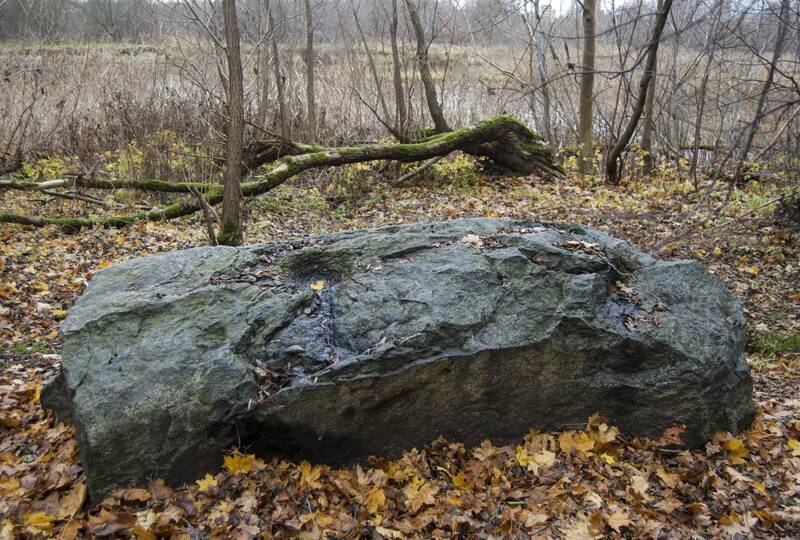 Thus, the Devil's Stone remained untouched on the bank of Danė River in Tauralaukis.